My site has been really weird the past two days. I don’t know if it’s just on my end or if it’s affecting any of you, but loading takes forever, and half the time I get an error or get logged out. I should have called GoDaddy today, but I was barely able to work today, let alone get anything else done. (Hey, Mel, is Mercury in retrograde again or something?) I’m not sure I’ll be able to publish this, actually (because of the technical problems I’m having, not because I’m in a funk). Let’s try. Despite my recent enthusiasm for shopping, Black Friday is still something I avoid. Like the plague. I have absolutely no interest in dealing with crowds of shoppers, and I think the day after Thanksgiving should be a national day of rest. I did go to one store. One superstore. One store I have no need to ever visit again. Cabela’s. It’s a hunting/camping/fishing kind of store. Like Bass Pro Shop, but with more taxidermied bears. (I assume. I’ve never been in a Bass Pro Shop, but it sounds more civilized.) SO totally not my kind of store. We tagged along with Emily and her boyfriend (who fishes) because, I guess, family time? It was…interesting. Aaaannd we came home with two bows. With arrows. Actual bows. Well, junior bows, like toddler’s first bow. Kid bows. And blunt arrows (of course). We set up cardboard boxes as a target in the backyard and pretended we were Robin Hood or Welsh longbowmen. And you know what? It’s kind of hard. And kind of painful. I don’t know if I was holding the darn thing wrong or what, but the string kept recoiling against the inside of my left elbow. Out of 20 or so shots, the string hit me (hard) 3 or 4 times. After the last one, I was about to start taking bets as to how long it would take before a bruise showed up when I rolled up my sleeve and actually looked at my arm. That’s when I ended my illustrious career as an archer. I already had the nastiest bruise I’ve ever seen, and on top of that, there was an egg-sized welt right in the middle. Even now, three days later, I look like I caught a fast ball with my arm. (The swelling went down pretty quickly after I iced it.) So I’m retired now. No more archery for me. The last two or three days have been lovely and almost warm. Now it’s windy and freakin’ cold. I guess it’s time, but I don’t have to like it. I’m catching up (a little) on the internet today, and I just had to share this. The Bloggess posted it the other day, and it’s just about the sweetest thing I’ve ever seen. 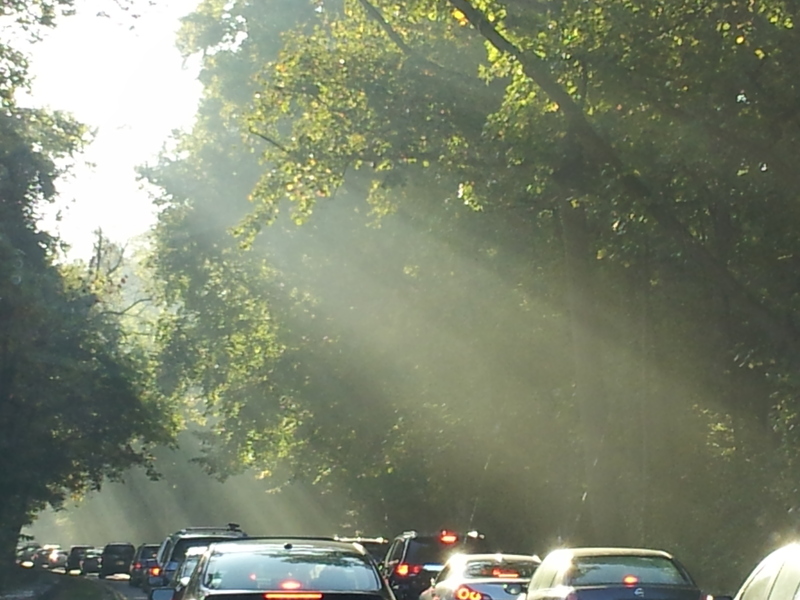 I love the George Washington Memorial Parkway. There. It’s like a load has been lifted from my shoulders. Yes, it’s a road, a HIGHway even, but I don’t care. I love it. Particularly the stretch between the Beltway and the Roosevelt Bridge. (It’s like the Merritt Parkway in Connecticut, but better because you can see the Potomac River on one side.) I would love it even more if it were a country road, two quiet lanes instead of four busy ones, but I guess I can’t have everything. I love it in the summer when all the trees are leafed out and they meet overhead and the sunlight is filtered through the leaves before it gets to the road, and I love it in the fall when all the leaves change color. I found out this morning that I even love it after the leaves have fallen. The trees were shrouded in fog this morning, and with the branches peeking through – it was really nice. By the time I crossed the bridge, the fog had burned off downriver, and the sun was coming up over the monuments (always a beautiful sight), but upriver it was still foggy, like really foggy, and all I could see was the top of the National Cathedral. I wanted to pull over to take a picture, but there’s no place to do that on that bridge, and I wasn’t in the mood to get killed this morning. 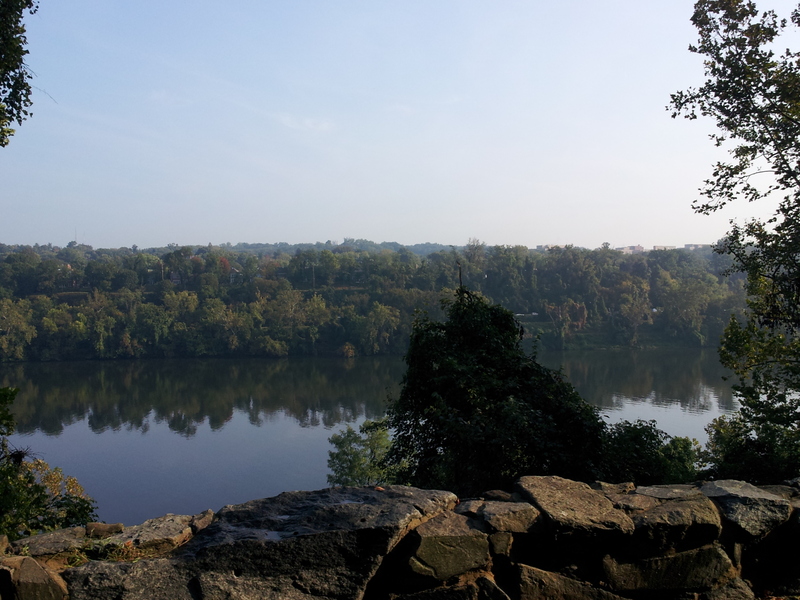 Instead, here are some pictures I’ve taken from the GW Parkway on other (sunnier) mornings. I solemnly swear I was at a complete stop when I took these pictures. See all those brake lights? NO ONE was moving. I baked today. In fact, I’m still baking. And I need to check on my pies – the last thing I need is burned pie after all that effort. So far so good. Now, at least. I was up to my elbows in pie filling about an hour ago. I pulled up my recipe (yes, MY recipe – eleven Thanksgivings ago, I experimented until I came up with the ideal sweet potato pie recipe), checked that I had everything to make two pies (I had double the ingredients listed in my recipe), and threw the sweet potatoes (I got them before breakfast this morning) into a pot to boil. All EIGHT largish sweet potatoes, because my recipe called for four. They boiled forever, and then they cooled, and then I got my mixer out. I peeled four of them, put them in the mixer, and realized that was about all that would fit. Okay, no problem, I’ll just get one pie ready, then do the second. I mixed everything together, pulled out my pie crusts (I make pie filling, not pie crusts), filled one of them, and realized I had enough filling left in the bowl for a whole ‘nother pie. What? So I filled the second pie crust. (I may have overfilled it a little.) Then I looked at the other FOUR giant sweet potatoes that were sitting there in the pot, already cooked, just waiting to be peeled and turned into pie. I had one more pie crust because I always buy one extra (I usually have enough filling left over for a little pie), but that clearly wasn’t going to be enough. I put the two pies that were ready to go into the oven, shoved the dogs into the backyard so they wouldn’t be tempted to counter-surf for drops of pie filling, and raced to the nearest grocery store for another pie crust. (I get nervous leaving the house with the oven on.) I got there, picked up one crust, grabbed a set of six mini-pie crusts (perfect for that little bit of filling left over, right? ), and raced back home. Nothing burned down, so I made the rest of the pie filling. Turns out those last four sweet potatoes were ALL bigger than the first four, so after I filled the other two regular size pie crusts, I had enough filling left in the bowl for at least another whole pie. No more whole crusts, though, so I filled the six little mini crusts and called my neighbor Beth. “Anyone in the family allergic to pie? No? Wonderful! ‘Cause I seem to have vastly overestimated how many sweet potatoes I needed to cook.” She opted for the mini pies, so John and I are now discussing who we’re giving the fourth pie to. (We’re keeping one, and two are slated for Thanksgiving dessert.) It has to be someone we’ll see in the next day or two, so it’ll either be a work friend or another neighbor. Tough choices to make. Anyway, I have now added the crucial information that was missing from my recipe. My sweet potato pie recipe, as written, makes TWO pies. Never forget. I wasn’t planning on doing any of the Thanksgiving cooking this year, but there was a special request for my sweet potato pie. Apparently, it’s John’s mother’s favorite, so she asked me to make two. I went out this afternoon to run errands, and on my way back, I took one look at the madhouse that was the Wegmans parking lot and went to Harris Teeter instead. Unfortunately, Harris Teeter didn’t have any of the right kind of sweet potatoes (I need the orange-y ones), so while I got everything else I need, no pie-making occurred tonight. I’ll have to do it after work tomorrow. That’s a good enough reason to skip my strength class, right? This makes so much sense. You know what doesn’t make sense? Radio stations. And holidays. The DC area’s easy listening station is ALREADY PLAYING CHRISTMAS MUSIC. What is wrong with people? Everyone knows Christmas music season doesn’t start until the day after Thanksgiving. A guy in a fedora held a door open for me today. That makes him twice the gentleman any other guy holding a door open would be. But then he got into a Jeep Wrangler. That is not the right car for a guy in a fedora. But what is the right car for a fedora-wearing dude? (It’s possible he was wearing a trench coat, too, but it’s more likely that my memory is making things up to fill in the blanks. Apparently, my memory wants him to be Humphrey Bogart (or Rick Blaine, anyway). But taller. This guy was taller.) I really don’t know the answer to that question – wait! I totally do (because I watch Mad Men). He should be driving a ’60s era Cadillac or something with fins. (John says a giant Cadillac or a ’58 Lincoln.) Definitely not a little bitty Jeep. Yoga is good and I shouldn’t skip it two weeks in a row anymore. I had good reasons (Halloween, then my lizard transformation – okay, maybe Halloween isn’t a good reason), but still. Tonight was hard because I haven’t done anything remotely related to yoga in three weeks. Except stretching after running (which I haven’t done much of, either). I stretched. Except not today. I don’t remember stretching this morning. Okay, none of this is making sense, and it doesn’t really matter since I’m back on the yoga wagon. Except for next week, since it’s the night before Thanksgiving and we’ll be on the road. But after that, I swear I’ll go regularly. Riley has been one uncontrollable bundle of annoying energy today. If he could focus that energy on keeping me warm, I could handle it, but instead he’s been bouncing off the walls while I sit at my computer and shiver. The thermostat says it’s 67 degrees in here. I don’t see how it could be. I’m so COLD. Just got distracted by Bookshelf Pr0n and Better Book Titles. And my fingers are too cold for typing. So…sure, I’ll publish this disjointed and not very entertaining blog post. Don’t judge me! I’m confused. The time change, the weather, the fact that Thanksgiving is next week already – all of these things are throwing me. Also, maybe it has something to do with the fact that I don’t have anything to worry about. There’s usually something, and given another day or so, I’m sure I could come up with a new thing to gnaw on, but it probably won’t be big. Why do I feel so weird? John does, too. We had a good weekend, fun, even productive: we finally made an appointment to get an estimate for putting hardwood floors in upstairs, something we’ve been talking about for probably a year now. I’m not that excited about my book – that’s probably part of it. I haven’t been making the time to read (what is WRONG with me?). The book I just finished (Sheri S. Tepper’s latest) was okay, but not gripping (definitely not her best). WAY heavy on the exposition. Okay, you know what? I can’t solve the mystery of why I feel at loose ends, but I can go upstairs and put something light on TV and clean up before the flooring guy shows up tomorrow. He needs to be able to measure, and right now you can’t see where the wall meets the floor. What do you do with one diamond earring? Sounds rhetorical, but I really need an answer. John bought me a pair (little diamond studs) last Christmas, and I love them. They’re exactly what I wanted, and I wore them every day, with everything. Then, out at dinner the evening after we spent the day at the Maryland Renaissance Festival (more on that later), I reached up to my earlobes and noticed that one of them was bare. How do you lose just one earring? Clearly, it’s not that hard. And since the earring wasn’t in my immediate vicinity in the restaurant, and it wasn’t in the car, it was most likely lost on the ground in 16th century England (otherwise known as some woods not too far from Annapolis). Maybe I can get my remaining earring turned into a necklace or something. Guess who we ran into while we were there? 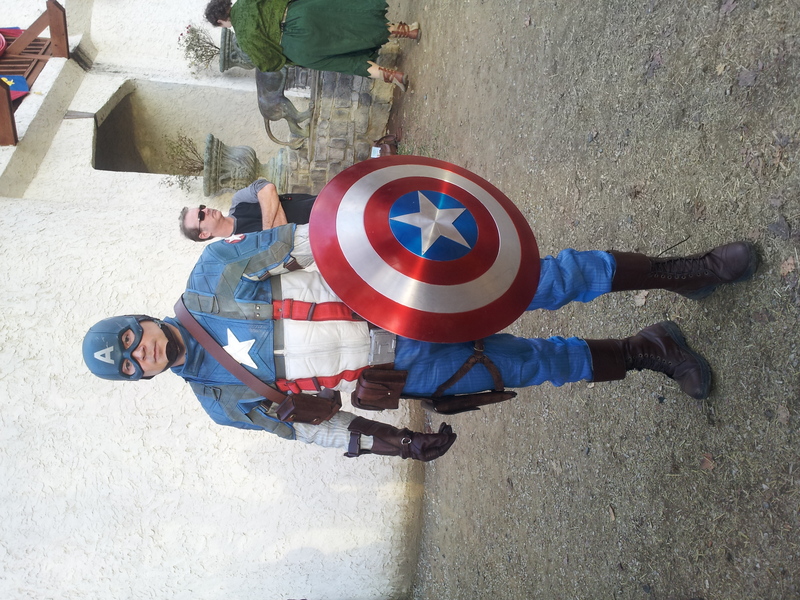 We don’t know what Captain America was doing at a 16th century renaissance festival, but his was the best costume we saw all day. Other than the Doctor’s, of course. His being there made more sense, what with all the wibbly-wobbly timey-wimey stuff (speaking of that, I totally want these). I wasn’t able to get a picture of him, but his costume was fantastic. I’m able to hide my mutation now (for the most part), so it’s back out into the world I go. I also tried lotion today, and that seems to be going well. I was supposed to stay away from lotion in case it aggravated my already tortured skin, but after four days at home with the heat on, my skin is SO DRY. And I figure if lotion is okay, then maybe sweat is okay, and maybe I can exercise again. So I might go to the gym tonight. Or maybe just run tomorrow morning. Polls have started closing, and I’m glued to my computer. I can’t stream CNN because we don’t have cable (same problem I had with NBC and the Olympics), but I can stream Brian Williams (yay) on NBC, so that’s what I’ll be doing. Hallelujah! I had to stay up for this, but now I can go to bed. Good night. I look like a lizard. Like a salamander. Or maybe a newt. It’s awful. Apparently, I’ve found another antibiotic I’m allergic to. Sure, that’s only two now, but one of them is amoxicillin, and that rules out everything in the -cillin family, which I think includes penicillin. (So someday I’m going to die because I need medication I can’t take because I’m allergic to it. Yay for me.) At least with that one, the reaction I have isn’t visible to anyone. With this one (bactrim), I turn into a lizard. A lizard on fire. Ooh, like a salamander! (I knew there was a reason I went for that one.) Seriously, though, I look scary. The doctor said I shouldn’t exercise for a few days (because I shouldn’t sweat – weird, right? ), so I’ll be fat and scary. Good combination. Too bad it didn’t happen right before Halloween instead of right after. Built-in costume. 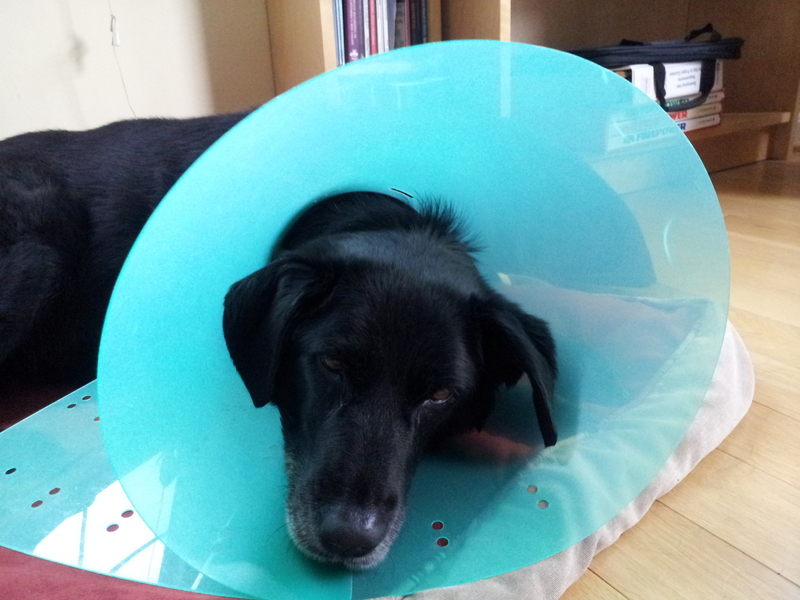 Roxy is still wearing her lampshade, but she’s doing much better. We gave her a break from it for a lot of yesterday (because we were home and could watch her), and we only had to stop her from licking her paw a couple of times. I’ll probably be home with her a lot this week. I don’t want to go out in public like this, so I will most likely work from home. Today is a sick day. Morning with the doctor, home for now, another appointment this afternoon – too disjointed to be productive at work. Man, if I have to look like a mutant (and I totally do), I should at least get some cool superpower. John Scalzi is voting for President Obama. His reasons why mirror mine almost exactly, but he articulates them much more clearly than I could. If you’re interested, go read. I think I’m getting old. My back hurts (lower back – it’s felt achy and a little twinge-y since my last Muscle Blast class two Mondays ago). My left arm was tingling off and on for almost a week (it’s stopped now) because I think I pinched a nerve doing a handstand in yoga class (a week ago Wednesday). I make grunting noises when I lunge to get over the dog gate at the bottom of the stairs, and worst of all, I was SO over Halloween after about the tenth group of kids. I lose patience for that quicker every year. All we were doing was handing out candy to the kids who came by. I can’t imagine how the parents of 8 or 9-year-olds must feel, trailing their kids down block after block. I mean, when they’re 3 or 4 or 5, they’re totally adorable, they need your help, and they get tired fast (very important, that). Beyond that age, can they even get tired out? It’s exhausting just thinking about it. 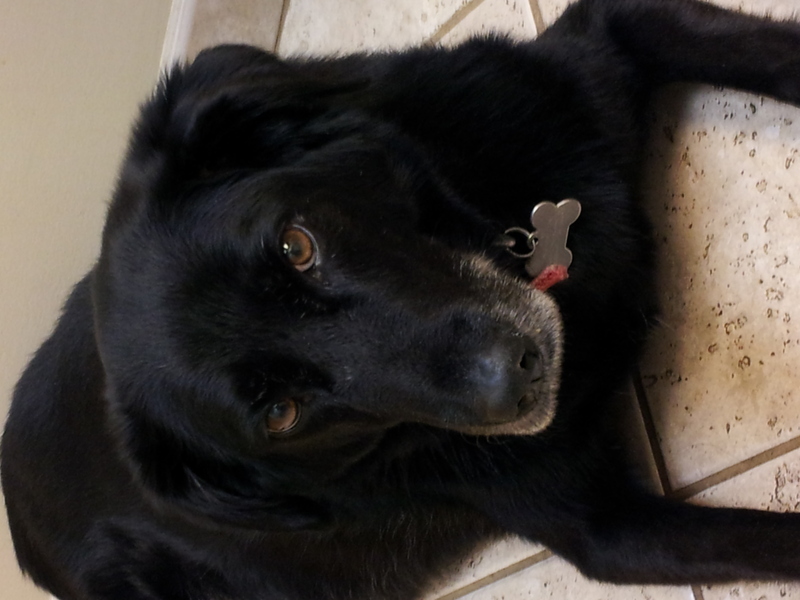 I missed the very beginning of the evening because I had to take Roxy to the vet. Once again, her paw was bothering her and she licked it so much she made it worse. Yay for obsessive dogs. And here she is today, completely miserable in her Cone of Shame. The sock just wasn’t working this time.